A Private Duty Nurse is an accredited RN or LPN, who provides one-on-one care to a patient for several hours each day, including monitoring vital signs, changing and dressing wounds, as well as catheters, IVs and medications. A Private Duty Nurse provides medical care that is high quality, professional and timely, and oftentimes, is the one to communicate with your doctor or hospital. He/she will know exactly what to look for and can recognize if a patient’s condition is worsening and in need of additional assistance, or if the patient is moving towards recovery. A Home Health Aide (HHA) is specially trained and certified to monitor the patient's condition, check vital signs and assist with essential daily care and routines. Administering medications, reconciliation and risk-management issues, escorting patients to therapy appointments and providing hospice care are also the responsibility of the Home Health Aide. Where to Find the Best Private Duty Nurse or Home Health Aide? It is always best to find and work with the most reputable and experienced nursing services company, one who is accredited by the State Department of Health and Joint Commission, has been in business for many decades, and has testimonials that speak to their level of care. All of these criteria are essential in evaluating which nursing services company to work with, and to ensure that you will find the best and most experienced pre-screened professional. A good nursing services company will have a large network of candidates that they already know and have worked with previously and have pre-screened. This company will also be able to match exactly who and what you need based on your personal care requirements — from cancer to Alzheimer’s, autism to ALS, MS to joint replacement or developmental disability. In addition, if your caregiver is ever sick, a good nursing services company has such an extensive health care network that they can quickly find you a replacement who will be just as perfect a match for your needs. 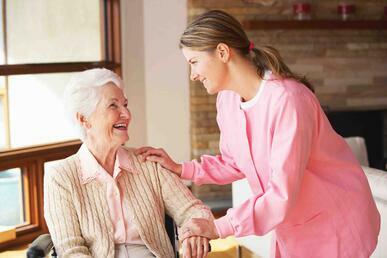 For more information, contact ACCESS Nursing Services, www.accessnursing.com, or phone 212-286-9200.